Hey guys, first time posting here, been a lurker for a while. My names Lucas and im from Raleigh, NC. Working on getting my YJ ready for 2016 wheeling and am going to try a couple comps this year for. Part of the work I'm doing involves doing some work to the rear suspension. The rules say the suspension must be a type used by the factory. It is staying on leafs, but I was planning to use sliders instead of shackles. Will it fly or do I need to stick to shackles? One other question is about the tire sizes allowed. Class 2 calls for 34-37 and I currently have metric 33s. I would run class 1 but can't because of f/r lockers. Since I don't see it as an advantage, are the 33s kosher or should I plan on picking up some bigger meats? 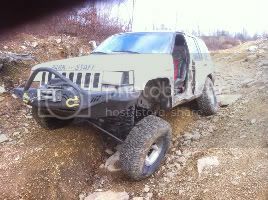 Forgive my newbness, been wheeling for years but have never competed before. Hi Lucas, great to see more people interested in comps! Their big thing is safety, everything else they can work with you on. 4 Point harnesses and a roll cage tied to the frame will be the big ones. Since you are allowed a slight wheelbase stretch and long arms, I don't think they will have any issue with slider boxes. As for the tires, depending on the course it may hinder you big time depending on your approach/departure angles, but I don't think they will rule you out. There is also Class X which is a for fun run what you brung class. Sliders are fine, Justin ran them on his CJ back when he was competing. As far as the tire size, you "can" run 33's in class 2. However some of the holes and climbs make 37's seem small. Be prepared to do a lot stacking. Hope to see you in the spring. Good to know! Looks like I'll be in the market for some tires soon Is tire grooving allowed? I have a line on some 37 a/ts but they've been grooved. Yes I don't see an issue with the slider boxes. Also one thing that looks like it will change is the use of two lockers for class one. A couple more days and we will have the info posted including the rules/ classes. Glad to see new faces. Oh and welcome to the madnes. Lol. Like the other guy said I ran slider boxes on my CJ in class 2 also reversed the shackles. Unless the rules have since changed, but by what I've read they rules are still the same. Also I had metric 34-35" tires in class 2, just more of a challenge. My spotter just had to work harder but we gave everyone a run for there money. Just remember 3 tires dirty rule! Going from 33 to 37 is a big difference I would recommend 37 if you have the money if not you can still have fun. That being said I'll be there with the same tires on my buggy in the X class. Tires are expensive. Way late to respond here, but thanks for all the info folks! I ended up sticking with shackles just relocating them to achieve a better angle so they won't invert on droop.